Vascular ulcers are commonly seen in daily practice at all levels of care and have great impact at personal, professional and social levels with a high cost in terms of human and material resources. Given that the application of autologous platelet rich plasma has been shown to decrease healing times in various different studies in the hospital setting, we considered that it would be interesting to assess the efficacy and feasibility of this treatment in primary care. The objectives of this study are to assess the potential efficacy and safety of autologous platelet rich plasma for the treatment of venous ulcers compared to the conventional treatment (moist wound care) in primary care patients with chronic venous insufficiency (C, clinical class, E, aetiology, A, anatomy and P, pathophysiology classification C6). We will conduct a phase III, open-label, parallel-group, multicentre, randomized study. The subjects will be 150 patients aged between 40 and 100 years of age with an at least 2-month history of a vascular venous ulcer assigned to ten primary care centres. For the treatment with autologous platelet rich plasma, all the following tasks will be performed in the primary care setting: blood collection, centrifugation, separation of platelet rich plasma, activation of coagulation adding calcium chloride and application of the PRP topically after gelification. The control group will receive standard moist wound care. The outcome variables to be measured at baseline, and at weeks 5 and 9 later include: reduction in the ulcer area, Chronic Venous Insufficiency Quality of Life Questionnaire score, and percentage of patients who require wound care only once a week. The results of this study will be useful to improve the protocol for using platelet rich plasma in chronic vascular ulcers and to favour wider use of this treatment in primary care. The term ulcer is used to refer to spontaneous or traumatic lesions, typically in the lower extremities, that do not heal in a reasonable time, with an underlying aetiology that may related to systemic disease or local disorders. The healing process is complex and dynamic . Once ulcers start to be treated, they eventually heal completely in most cases. However, due to some risk factors associated with the patient (comorbidities) or to the ulcer (infection), acute ulcers can become chronic . Vascular ulcers represent a common severe health problem. Several studies report a prevalence of 1 to 2% for venous ulcers in the general population -, and this type of ulcer represents 75 to 80% of all vascular ulcers. From these data, it can be estimated that in Spain there are between 250,000 and 300,000 people with venous ulcers, implying that 300,000 to 375,000 people have vascular ulcers. In line with these figures, vascular ulcers represent a common disorder in daily medical practice at all levels but especially in primary care (PC). They have a significant impact at the individual, professional and social levels with a high cost in terms of human and material resources. However, it is still not well understood why venous ulcers develop, research efforts being ongoing to establish new theories on their pathogenesis . Further, the current approach to their care does not always achieve adequate healing of these ulcers, and hence a range of alternative treatments is being tested ,. Autologous platelet-rich plasma (PRP) is a product derived from blood that is increasingly widely used in clinical practice and, among other applications, it has become an alternative to the dressings used to date for the treatment of vascular ulcers. The curative properties of PRP rely on the fact that platelets are a physiological reservoir of growth factors, which have an active role in tissue regeneration. It is well known that platelets contain a great variety of growth factors, with healing functions . On the other hand, despite evidence on the effectiveness of autologous PRP in venous ulcers, the effectiveness and feasibility of this treatment in the general population in primary care remain unclear. Most of studies have been limited to small groups of the population, in private clinics and hospitals . The Salazar-Alvarez et al. prospective study, which is done in PC on 11 patients, concludes that PRP is a valuable and practical procedure that promotes the healing of chronic ulcers of the lower extremity . However, it is necessary to conduct a well designed controlled clinical trial, examining the effect ofPRP in both ulcer healing and the patients’ quality of life. For these reasons, we propose a phase III clinical trial. After 2 months, treatment with PRP will lead to at least a 20% greater reduction in the ulcer area than observed in patients receiving standard care based on the current protocol in PC of moist wound care (MWC). To assess the efficacy in healing the ulcers attributable to autologous PRP by estimating the change in the ulcer area using serial photographs, at baseline and 5 and 9 weeks after starting the treatment, compared with that in the control group. To assess the safety of autologous PRP for the treatment of venous ulcers in patients with chronic venous insufficiency corresponding to C6 on the CEAP classification (C, clinical class, E, aetiology, A, anatomy and P, pathophysiology of the disease), describing changes in patient perceived pain, the percentage of ulcers with infection, and related perilesional changes, in both groups and comparing the results. • To estimate the quality of life of patients in terms of the Chronic Venous Insufficiency Quality of Life Questionnaire (CIVIQ) score in both groups at baseline, and 5 and 9 weeks after starting the treatment. We will conduct a phase III open-label, parallel-group, multicentre, randomized study. We will analyse 150 patients between 40 and 100 years old who have venous vascular ulcers and are assigned to ten health centres of the Basque Health Service (Osakidetza) in the Ezkerraldea-Enkarterri, Barakaldo and Bilbao health region. Two groups will be formed: one intervention group, to be treated with autologous PRP and a control group, to be treated following the current recommendations for MWC. Treatment with autologous PRP involves five steps: blood collection, centrifugation, separation of PRP, activation of the coagulation process using calcium chloride and placement of the PRP dressing, covering it with a secondary dressing. Given that it is not feasible to use a placebo that could blind those involved to the use of the autologous PRP, the control group will receive conventional treatment of MWC, which is the usual care provided in our health service, and this will be carried out in accordance with the recommendations of Basque Health Service (Osakidetza). The study is to be conducted in the PC health centres of, eligible patients being all those with venous vascular ulcers aged between 40 and 100 years of age under the care of Ezkerraldea-Enkarterri, Barakaldo and Bilbao health region, these centres and currently being treated with MWC in accordance with the recommendations of Basque Health Service (Osakidetza). Any other problems that in the opinion of the research team justify treatment withdrawal. Patients will be recruited by the representatives of the ulcer commission of the health region or, in the absence of such a figure, the person appointed for this in each of the participating centres. Before starting the study, all those involved will be contacted to explain the study methodology. The recruitment process is to start in the treatment rooms of the health centres (Figure 1). Each of aforementioned individuals responsible for this process will have access to the necessary information for consecutively recruiting patients in line with the inclusion and exclusion criteria. When eligible patients are identified, the nurses will explain the possibility of their inclusion in the study and if they agree to participate, they will be referred to the assigned outpatient clinic, a corresponding appointment being arranged for them. Patients will have an appointment in the health center; they will be seen by a doctor of the centre, who will carry out an interview to collect data related to the selection check list, and they will be weighed, their height measured, and a ABI test will be performed. 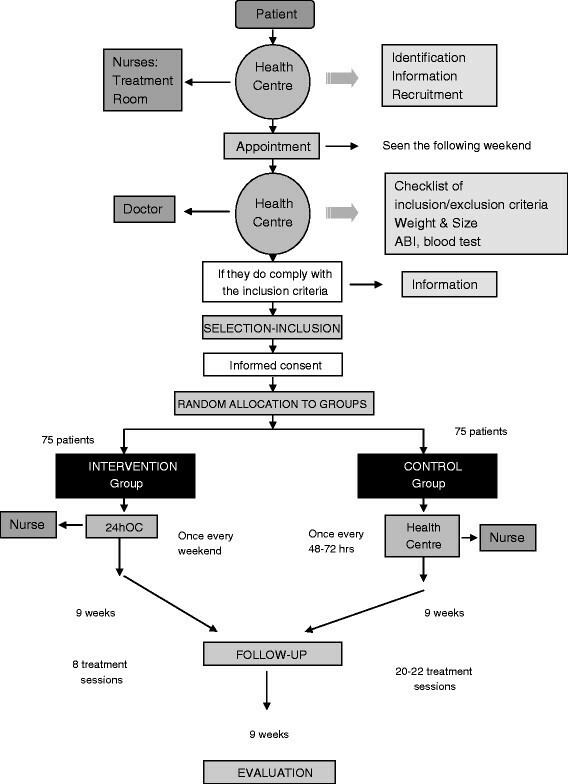 If the patient meets the inclusion criteria, they or their legal guardian will be asked to give verbal and written informed consent before inclusion in the clinical trial, and after a “Patient Information Sheet for research projects involving the use of biological samples” has been provided and explained to them, by the principal investigator. Once patients give informed consent, the doctor will contact the Primary Care Research Unit of Bizkaia to request that the patient be randomly allocated to the control or intervention group, and their inclusion in the study will be reported to their general practitioner. The patient’s wound will be cared for as usual, and they will be given a patient handbook including a diary to keep a daily record of their experiences and any adverse effects, and an appointment will be made for their first treatment as part of the study, either using autologous PRP or under the MWC protocol, depending on their group allocation. The patient handbook also includes a telephone number they should call in the event of any unforeseen problems between treatments. In the event that there is no record in a patient’s medical record of a blood test having been performed in the 6-months prior to inclusion in the study, the general practitioner will request a blood test, the results of will be taken as the baseline measurement. Patients in the control group will be treated as they had been prior to inclusion, that is, two to three times a week and in accordance with the health region recommendations, namely to maintain a moist healing environment. The wound care will consistently be provided by the same nurse, who will be responsible for making the appointments within the available timetable in the treatment room. The data will be registered in an Access database by the administrator. The treatment schedule for the control group is displayed in Tables 1 and 2. Week(1): the wound will be treated every 48 to 72 hours during these weeks, as required in each case (depending on the condition of the ulcer). Patients in the control group will be treated following the recommendations for MWC of Osakidetza (described in the rational use of the moist wound care products section of the Osakidetza 2011 continuous professional education guide). Material is selected for wound care depending on the assessment of the bed of the wound and surrounding skin, as well as the type and amount of exudate and whether there are signs of infection. These wound care treatments will be carried out every 48–72 hours, in line with the current usual practice. There are multiple types of dressings, each of which have a proposed indication as well as certain known advantages and disadvantages. It is important to recognise that no single dressing is suitable for all types of ulcers and few are indicated for all stages of healing. For a given wound, the ideal dressing should absorb excess exudate, create a moist environment, and maintain an adequate pH, while also being thermally insulating, impermeable to bacteria and easy to change, as well as not causing allergic reactions or damage when removed. Hydrocolloids: for debridement and promotion of granulation tissue, one of their strengths being that they are not very absorbent. Polyurethane foams: hydrocellular dressings and hydropolymer dressings; the latter are indicated for moderate to high amounts of exudate, but their disadvantages include that they do not absorb exudates or debride the wound in the same way. When selecting a dressing, as well as the characteristics of the wound, it is necessary toassess the general status of the patient, the availability of resources, and the cost-effectiveness of alternatives, as well as how easy it is to apply. Patients in the intervention group will receive wound care once a week with autologous PRP, based on the estimated mean lifespan of platelets (7–10 days). The treatment with autologous PRP will be performed in the assigned outpatient clinic, in the phlebotomy room, by qualified nurses (IL, IH, BR). As in the control group, the nurse will be responsible for making appointments for the next treatment and will collect data to be entered in an Access database by the administrator. The first treatment session of the study will be performed on day 8, and the data will be recorded in the patient medical record. From this point onwards, data will be collected every 7 days for 9 weeks. Treatment schedule for the PRP group is shown in Table 2. A main variable, in terms of the difference in the surface area of the ulcer at weeks 5 and 9 of treatment compared to baseline, expressed as the percent reduction in area for each of the patients in the intervention and control groups. Surface area of the ulcer, expressed in square centimetres and measured at baseline and at weeks 5 and 9, using the ImageJ software to analyse photographs taken at these time points. Score on this specific scale for assessing the quality of life of patients with chronic venous insufficiency, considering four dimensions (physical, psychological, social and pain). This secondary variable will be measured using a questionnaire for the patient, yielding a score between 20 corresponding to the lowest quality of life, and 100, the best quality of life. The questionnaire will be administered and the score recorded by the nurse in the baseline treatment session, and again at weeks 5 and 9. Will be assessed in terms of any adverse effects recorded by patients and by the weekly interview carried out by the nurse, who will ask about the pain, assess the degree of infection and the type of exudates, as well as any adverse effects associated with the treatment, comparing with the results in the control group. At all of the appointments during the study period, the nurse will ask the patients whether they have experienced any adverse effects. Any effects identified will be recorded by the nurse himself/herself in the database created for the purpose, with the following data: severity and potential relationship with the study treatment. In addition, there will also be a committee independent of the research team that will monitor the safety of the treatment under study and review any adverse events that do arise during the study. Complying with the current legislation, any serious adverse reaction (SAR), or unexpected serious adverse reaction, (USAR) will be reported to the health authorities within 24 hours of being detected. The follow-up period will last for 9 weeks, but all the adverse effects that appear within 30 days of stopping the treatment will be recorded. The estimated sample size is 150 patients, based on a previous meta-analysis by Martinez-Zapata et al. . The patients will be randomly allocated to the intervention (treatment with PRP) or the control group (standard moist wound care), in a 1:1 ratio which involves 75 patient per group. The calculation is based on a clinically meaningful difference of at least 15 points between groups, for α = 0,05 and β = 20%, and considering 30% of withdrawal. The categorical variables will be presented as frequencies and percentages (for example, the percentage of patients requiring ≤1 weekly treatment) and continuous variables using measures of central tendency and dispersion (mean and standard deviation for normally distributed variables, and otherwise median and interquartile rank). The analysis of the efficacy will be carried out on an intention-to-treat basis by comparing the percent reduction in ulcer area, observed in each of the groups after 5 and 9 weeks of treatment, with respect to baseline. Using the Mann–Whitney U non-parametric test, we will estimate the effect attributable to the intervention using the difference between the changes occurring in the two groups. Subsequently, in order to adjust the comparisons for the baseline measurements, we will carry out covariance analysis models. As well as adjusting for baseline, we will adjust for the potential confounding or effect-modifying covariates. A p value <0.05 will be considered statistically significant. All the analyses will be performed using SAS version 9.2 statistical software. Quality control will consist of collecting data on adherence to the intervention, patient inclusion and follow-up, as well as the monitoring the quality of data entry. Monitoring: This study will be monitored Veronica Arce, a nurse who works for the Primary Care Research Unit of Bizkaia, a body that provides methodological and statistical support for the trial; she will perform two checks per patient, in the first and last visit. the study sponsor will be contacted as soon as possible. In any case, all violations will be notified to the relevant authorities in accordance with current legislation. This research project will be carried out in accordance with the principles of the Declaration of Helsinki and in compliance with current legislation on medical research. Prior to carrying out the study, approval will be sought from the Management of the Ezkerraldea-Enkarterri Health Region as well as consent from the participating patients, guaranteeing that the anonymity and confidentiality of the data collected will be safeguarded as provided for in the Spanish Organic Act 15/1999, of December 13, on Personal Data Protection. Any substantial changes to the original documents will be submitted to the Ethics Committee and/or the regulatory authority for approval. The trial staff will ensure the preservation of the anonymity of patients. Patient records will be coded with 5 digits: the first referring to the outpatient or health centre, the second to the ulcer and the last three to their order of inclusion. Taking into account that the treatment applied to both groups consists initially of a topical treatment, with significant differences in the appearance of the dressing to be applied, patients will be aware of their group allocation, as will the researchers, meaning that it is not feasible to double blind the study. To prevent the results of the research being influenced by observer bias, the progress of the ulcers will be assessed by someone independent of the research team, who will have exclusive access to photographs of the ulcers, with no type of identifying data related to the patient or their group. This study has two main objectives efficacy and safety of autologous PRP, while we also hope to explore its effect of quality of life and cost-effectiveness. Prior to determining the efficacy of PRP, we consider it important to investigate multiple factors related to the feasibility of using this treatment in the PC setting. We believe that the autologous PRP-based approach may be able to reduce the costs associated with the management of this type of health problem. Venous ulcers treated by conventional wound care (in accordance with the recommendations of the MWC of Osakidetza) take at least 10–12 weeks to heal, meaning significant financial and personal costs as well as impairment in the quality of life of patients with daily treatments and risk of infection associated with the daily management of ulcers. Preliminar studies show that PRP is a safe, simple and effective procedure in treating chronic venous ulcers . We presume that using PRP treatment it would only be necessary to clean the wound repeat the PRP application procedure once a week, since the mean lifespan of platelets is 7–10 days. With this study, we will be able to assess whether this technique could be cost-effective in PC. Autologous PRP treatment is used for managing various types of lesions including corneal, vasculitic, neuropathic and diabetic foot ulcers, among , others. Several studies using this technique have demonstrated a decrease in healing time compared to conventional treatments (in particular, the currently recommended MWC), though no studies have been undertaken in PC . However, a recently published meta-analysis  has underlined the variability between the results published to date, concluding that it is not yet possible to recommend this type of treatment due to the lack of rigorous studies with representative sample sizes. Further, the Spanish Agency of Medicines and Medical Devices that regulates the use of PRP has encouraged researchers to continue investigating this treatment with high quality protocols and representative samples to help to ascertain whether it is effective . The high proportion of the population seen at the first level of care (i.e., PC) means that this setting provides great opportunities for carrying out social and health research and establishing preventative measures that can be extrapolated to the entire community: in any intervention measure or research project, the closer to day-to-day reality, the better the application in clinical practice . This is particularly true in the case of ulcers, the majority of this type of lesion being cared for in PC. This study can be undertaken thanks to the financial support of the Spanish Carlos III Health Institute. We are grateful for funding from the Department of Health and Consumer Affairs of the Government of the Basque Country, the Basque Health Service (Osakidetza) for the pilot support and the Ezkerraldea Enkarterri health region. SSMK, HI and LI drafted the original protocol. B-AN, G-FMC, LLJ, RB, G-MN, GG and AI have contributed to developing the study design. All authors read and approved the final manuscript. Alonso Verduras C, Baró PazosF, Blanquer Blanquer M, Felipe Fernández P, Fernández Santos ME, Gómez- Chacón C et al., Informe de la Agencia Española de Medicamentos y Productos Sanitarios sobre el uso de Plasma Rico en Plaquetas. Spanish Ministry of Health, Social Services and Equality. 23 May 2013 (Jordi Daniel i Díez Junta Directiva de la SEDAP). http://www.aemps.gob.es/medicamentosUsoHumano/medSituacionesEspeciales/docs/PRP-AEMPS-DEF-mayo13.pdf Accessed 5 Jan 2015.